I get so many questions about this, so I finally decided its time you tell you all about my historic sittings with H.R.H. Prince Charles. I was invited to H.R.H’s home throughout 2009, to do the sittings which lasted between 40-60mins. I couldn’t quite believe at the time, that I was going to his house but he settled my initial nerves by being so nonchalant. His home was beautiful and kinda what you would expect. There are ornate objects, fascinating sculptures and large paintings everywhere which I would look at uninterrupted while I walked the corridors of his home. There’s even red carpet in the bathroom! Sitting with Prince Charles though was fascinating in itself. His stories, demeanour and presence don’t make you feel like a subject. It feels more like being with your kind uncle. He talks very passionately and gets quite shy at times. He was very interested in my life an career which was a shock to me and he asked me all types of questions. When he saw the work his reaction was priceless and he was shocked what I noticed about his face. H.R.H. 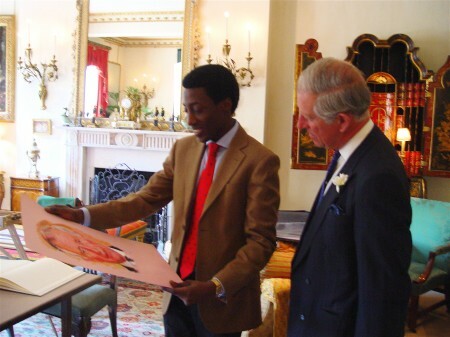 Prince Charles was a pleasure to draw, he didn’t complain once in the periods he sat for and was one of the most gracious an intriguing people I’ve ever met in my life. The sittings where conducted in over 6 months and the work now resides in his home.